This article originally appeared in Total Guitar magazine issue 229. Reproduced by permission. Words: Joe Bennett. Illustration: Andy Watt. Click the image to download a pdf. It’s a common feeling. You write a line and it immediately sounds just right. Timeless. Familiar. Almost… too familiar. You play the finished song to your mates and someone notices – you’ve copied someone else’s track. Gutted, you delete that great-sounding line and spend hours trying to write something that sounds as good. This sort of accidental copying happens to every songwriter from time to time. Most of us just exhale sadly and hope wait for inspiration to flow again, following the tracks of our tears. But some take the darker path, keeping the copied section and hoping that no-one will notice. Leading us to the inevitable question: how much of someone else’s song can actually be copied? The answer, frustratingly, is ‘none at all’. Contrary to popular myth, there is no maximum number of notes you can copy ‘legally’. If your song sounds recognisably like part of another song, and the other side can demonstrate in court that copying has occurred, you could end up owing someone a lot of money, or even lose ownership of your own work. But that’s unfair, say many songwriters. There are only 12 notes to the octave, and surely I’m bound to copy a song accidentally sooner or later – infinite numbers of monkeys and all that? Well this argument doesn’t stack up when you apply some simple maths. It’s actually quite easy to write a unique melody, because there are hundreds of billions of possible combinations of pitches and rhythms over just a few bars. Notes themselves cannot be owned, just as a painter cannot own a colour nor a poet copyright a word. It’s the arrangement of notes in order that creates melody, and therefore the longer the melody, the greater the odds against it being coincidentally similar to another. It’s the grain-of-rice-on-a-chessboard theory – the numbers multiply up very quickly. However, popular song, and particularly rock, likes parts of its musical palette to be fairly restricted. And sometimes a musical idea becomes so common that it enters shared ownership. An obvious example is the 12-bar blues chord sequence. Presumably someone, back in the day, thought this combination of chords was ‘original’ and wrote a song around it. This inspirational bluesman may be long gone but his musical idea remains, endlessly recycled by all of us in many a jam session, and cheerfully copyright-free forever. 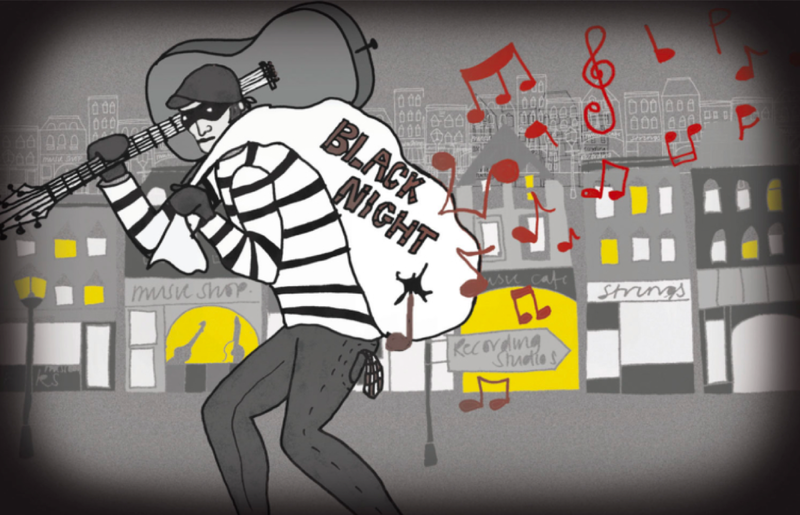 But ‘Black Night’ is an exception, and in most cases such blatant copying would land the songwriter in very hot water indeed. So here are some rules of thumb to keep your songs from harm. Use whatever chords you like – it’s almost impossible to copyright a chord sequence. Don’t steal any melody knowingly – it’s just not worth the risk, and this certainly includes riffs. Re-use someone else’s title if you must, although it’s a bit crass and unnecessary to do it. And avoid stealing lyrics at all costs – it’s a dead giveaway. For songwriters, the question is a moral one. Why would we want to copy someone else’s ideas when the art of songwriting is all about our own creativity? Surely it’s better for us all to respect each other? Or put another way, imagine all the people, living life in peace. Oops. Note: the psychological term for unintentional plagiarism is ‘cryptomnesia‘. I’ll be publishing some academic work about the effects of cryptomnesia on songwriters later in the year. Sometimes an original melody might have certain parts that match another song perfectly. Coincidence? Plagiarism? Who cares? It’s impossible for any song to be 100% new. Music is brings people together – often by taking an existing concept and building on it. Sue me.